The federal agency reported that Alberta’s unemployment rate rose to 6.8 per cent for the month, up from 6.4 per cent in December. Employment declined for the second straight month in the province. In the Calgary census metropolitan area, the unemployment rate fell to 7.3 per cent from 7.5 per cent the previous month. Employment in the Calgary region rose by 2,900 month over month and by 6,900 year over year. In the Edmonton census metropolitan area, the unemployment rate rose from 6.3 per cent in December to 6.4 per cent in January. There were 200 fewer jobs in January but from a year ago employment in the region was higher by 33,800 positions. Across Canada, StatsCan said the number of people employed grew by 67,000 in January, mostly among youth aged 15 to 24 and in the services-producing industries. The unemployment rate increased 0.2 percentage points to 5.8 per cent as more people looked for work. On a year-over-year basis, total employment was up 327,000 or 1.8 per cent, reflecting increases in both full-time (+166,000) and part-time (+162,000) work. “In January, the number of employees increased by 112,000 in the private sector, while it was little changed in the public sector for the third consecutive month. At the same time, the number of self-employed declined by 61,000. On a trend-cycle basis, self-employment has levelled off in recent months,” said StatsCan. “The wild ride continues for Canadian employment readings. Following a quieter month in December, volatility returned, with the Labour Force Survey suggesting 67,000 jobs were created in January. 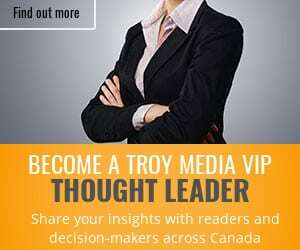 That blew past expectations for a modest 5,000 gain,” said Royce Mendes, an economist with CIBC Economics. “There had been some risk going into the report that a big print was coming, given that the survey had lagged the job gains seen in the more reliable payrolls report over the past year. The details were relatively solid too, with the all of the jobs coming in paid employment and a slight tick up in wage growth despite Ontario’s minimum wage increase falling out of the annual calculation. The unemployment rate did rise, but only because of an increase in the participation rate.